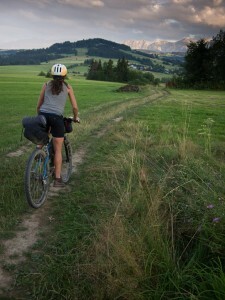 How did you get into traveling by bike? The short version of the long story is that I rode bikes as a kid, bought a base-model rigid mountain bike with lawn mowing money as a teen, then a hardtail mountain bike with a suspension fork. That last bike–a Gary Fisher Tassajara–was awesome and has inspired everything since, indirectly. I moved to Tacoma, WA for college and thought I would ride in the mountains all the time, but the mountains were nowhere nearby, it turned out. Instead, I got into road bikes, road touring bikes, fixed and singlespeed bikes, used bikes, bicycle history, home bicycle mechanics, records, longboard skateboards, and not school. I worked in Tacoma for a few years, growing more familiar with bicycle mechanics and life on a bicycle. One day, Lael and I rode our fixed gear bikes from Tacoma to Seattle to visit her sister. We mapped an approximate route, we packed some things, and we got there. The ride was nearly 50 miles. Though we were a little tired and a very proud, it seemed easy. Enroute to Seattle, Lael suggested that if we could ride 30, 40, 50 miles in a day, we could string some days together and really go somewhere. We planned a cross-country road trip for the summer, which fell through. Instead, we left on Sept 18, 2008 from Portland, Maine on our bikes. We arrived in Key West, Florida two months later via Montreal, New York, Pennsylvania, Maryland, West Virginia, Virginia, North Carolina, South Carolina, and Georgia. It is also important to note that we immediately found work in Key West. After a few months of sun and saving money, we left town on our bicycles. This has been the approximate pattern ever since: ride, work, ride. Did your trips get progressively longer or did you at some point just jump from overnighters to multi-month excursions? We jumped from in-town commuting to a several month trip. We did one shakedown overnight trip to a state park about 40 miles away (Belfair, Washington). Raccoons got into out food, and our first real bike trip was nothing like this planning trip, but it helped to prove to ourselves that we could do it. The important thing is to leave on a trip, not to plan or prepare for it. You and Lael have an amazing number of trips under your belts in many countries. 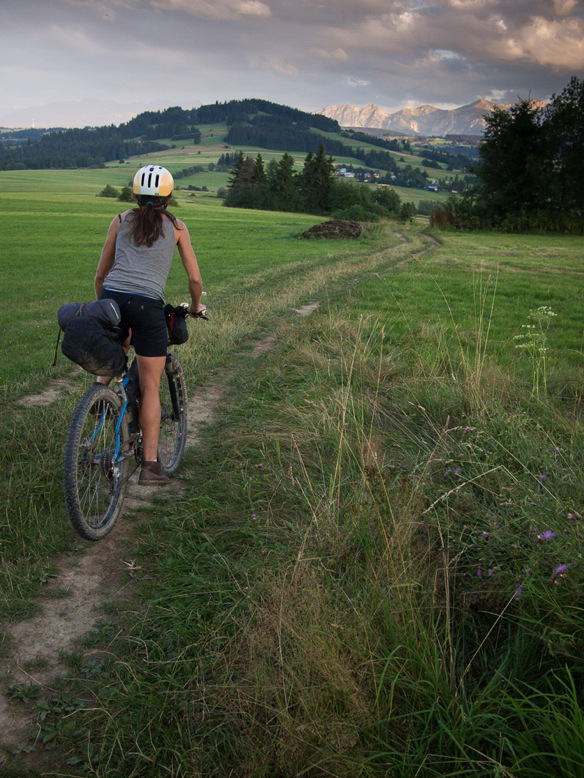 It seems silly to ask which was your favorite, but is there a trip or a story from a particular trip that stands out in your mind as the apex of bike travel for you? Maybe better put, is there a story in your mind that captures why you do this? Lael on the Red trail to Zakopane, Poland. Photo by Nicholas Carman. When we landed in Amsterdam, we were happy to be done with work and our obligations in Albuquerque, New Mexico, where we had lived for the winter. 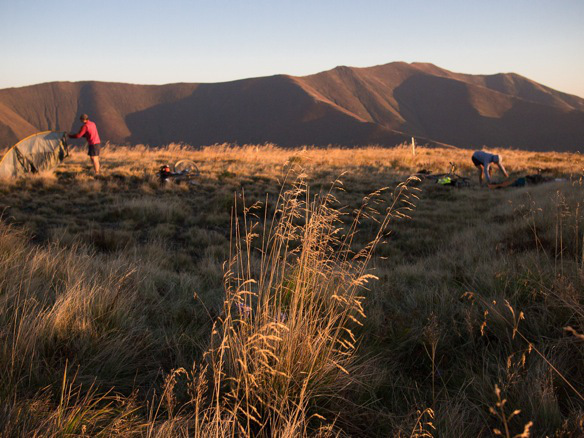 We arrived with mountain bikes and bikepacking equipment, with little knowledge of our route. From our time living in France, we knew a little about a dense network of walking trails. Some research suggested the trails were legal to ride. We hoped that surrounding countries might have similar resources. Less than a day outside Amsterdam, still along the coastal plains of the North Sea, we connected to walking trails, largely composed of dirt, sand, and gravel. We followed similar signed routes through ten countries all the way to Ukraine. Each country has its own signage, support, and trail culture. But every country has trails! We pushed our bikes up small mountains in relatively flat countries, we slept in a castle, rode through a Cold War bunker in Ukraine, visited a shepherd who prepared smoked cheese in Poland, ran into Joe Cruz in Prague, and couldn’t figure out how to flush the toilet on a Swiss train (very fancy). We slept outside almost every night, never paid for camping, prepared our own food, and drank the world’s best beer, wine, and liquor from Belgium and France to Ukraine. Finally, we traveled to meet my family in Ukraine. My grandparents emigrated to the US immediately after World War II, and were in transition for many years during the war. I spent my birthday feasting at three separate homes within a six-hour period in the village where my grandfather grew up. I enjoyed layered torte, fruit compote and fresh vegetables on the property where he was born. Even when it isn’t about bikes, it is. 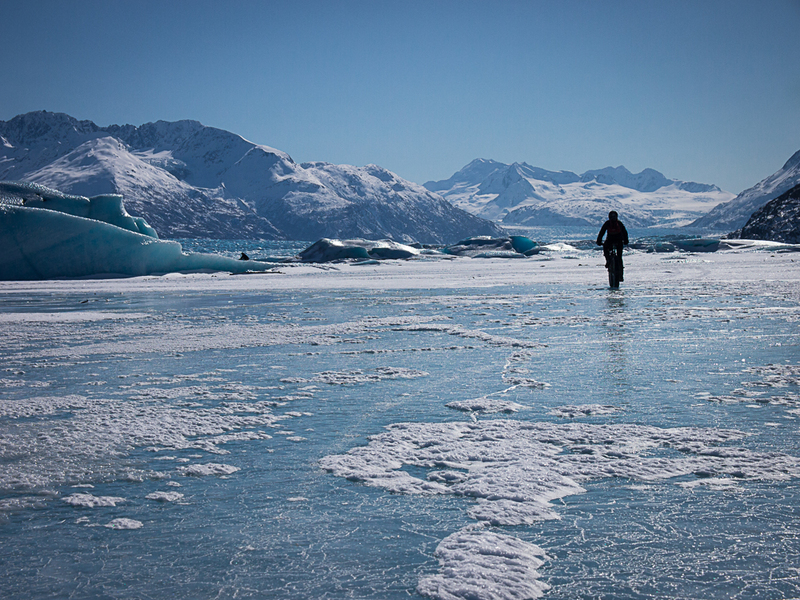 Riding to the Knik Glacier in Alaska. Photo by Nicholas Carman. How have you structured your life to allow for such extended trips? Work hard with a purpose, save money, don’t worry too much, save money, sleep outside, ride a bike, don’t buy stuff, don’t worry, ride a bike, save money, work hard and eventually quit your job because your life is more important. We each make less than $15K per year, I think. Lael works at restaurants mostly, but has also worked as a math tutor, English teacher in France, baker, and a pedicab driver in Key West. I’ve spent some time in restaurants in Alaska and New Mexico, as a pedicab driver in Key West, as a marine forklift operator in Tacoma, a few months at Velo Orange in Maryland, and less than a year in bike shops in Anchorage and Albuquerque. A lack of overall structure is probably more important than anything. Right now, I expect that we will leave on a bike trip in late July. I don’t know where or for how long, but we are going somewhere. I’m working seven days a week at a bike shop right now, trying to write a feature article for a magazine, sell a bike, built several wheels for some new bike projects. Last week I went riding every day for seven days after work, and came home past midnight every night. At some point, I’ll wake up to a substantial savings and an overwhelming urge to get out of town. The pattern of working and not working is productive–each phase is purposeful. Polonina Borzhava, Carpathian Mountains, Ukraine. Photo by Nicholas Carman. You’ve written about your evolution of acceptance for new bike technology and getting tired of the “classic friction wool lugged steel lobby.” What brought about that shift and what are you touring on now? That old steel lobby is a pragmatic bunch, but pragmatism isn’t the same as fun. I draw from many places, and since I’ve grown interested in suspension, alternative materials, trail riding, tubeless wheels systems, and lightweight travel–in combination with all of my old habits–the bikes I ride are really eclectic. I’m currently riding a Salsa Mukluk, converted to 29/29+ with a set of 45mm wide Velocity Dually rims, a 120mm Fox suspension fork, and a wide Race Face carbon handlebar. It’s a mountain bike, no doubt, but it pedals on the pavement just fine, and even makes my in-town commutes more fun. I’ll be selling the Mukluk soon and swapping parts to a Surly Krampus frame, which I intend to take away with me. I may be in possession of some 35mm wide carbon rims for this project. I can’t say for sure, but don’t tell the lugged steel people. I’m still riding a Brooks, if that is any consolation. I’ve worn through the embossed Brooks logo on the saddle. Romania sounds cool, as does Georgia. Fly into Lviv, Ukraine maybe. I am fascinated with the Black Sea region right now. This changes daily. Tomorrow morning I’ll open my computer to discover that Lael has been browsing a Wikipedia page about South Africa and flights are cheap and then we’re there. Officially, I don’t know yet. 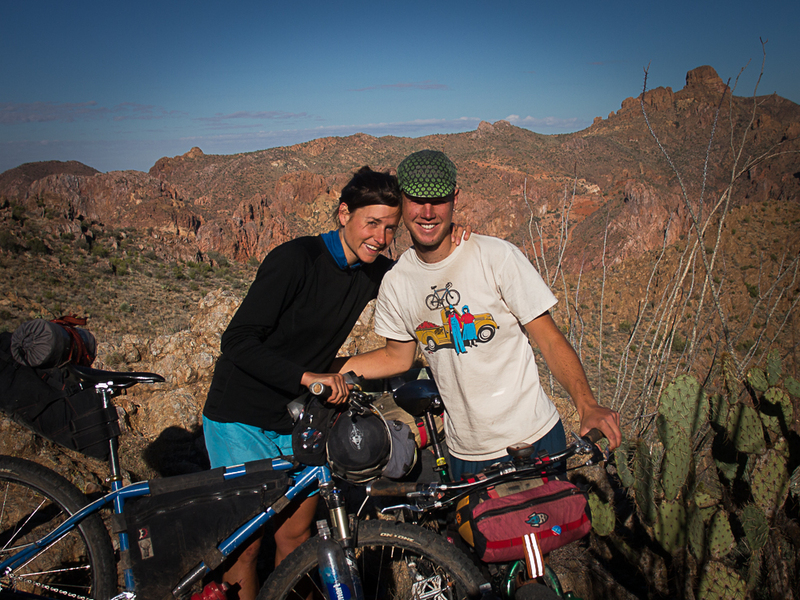 This entry was posted in Bike Touring, Interviews and tagged bike touring, bike touring europe, bikepacking, fat biking, gypsy by trade, lael wilcox, nicholas carman, nicholas carmen, ukraine. Bookmark the permalink. Absolute wisdom from one of cycling’s (and the world’s) master philosopher/explorers. Almost every word is a quotable truism and were it up to me (and who knows? It MAY be up to me) this guy would be running the planet, in his spare time. I have followed Gypsy Nick for many years now and he is the realest of the real deal. Thanks for the post and I will be back to spread my genius (and other stuff) around your pages. Sorry, but there is nothing I can do about it. Thanks TJ. That means a lot to me, as always.